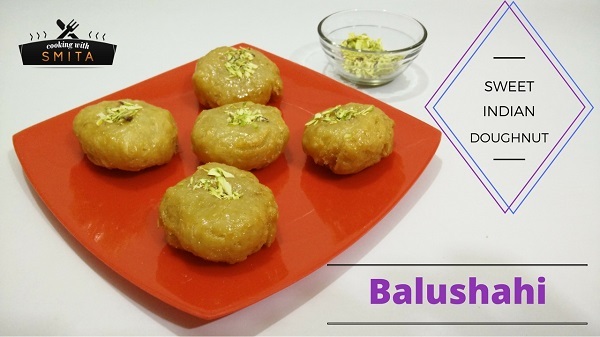 Balushahi is a traditional dessert in Indian, Nepali and Bangladeshi cuisine. Balushahis are made of Maida flour (All Purpose Flour), and are deep-fried in clarified butter and then dipped in sugar syrup. Learn how to make Balushahi at home with this step-by-step recipe. Take All Purpose Flour in a large bowl, add Soda, Salt and mix well. Add Curd, Clarified Butter (Ghee) and mix well. Add water little by little and prepare a soft dough. Let it rest for 10 minutes. To make Sugar Syrup, add Sugar in a heavy bottom pan, add water and boil. Stir until Sugar is dissolved. Boil till you get 1 string consistency of syrup. Make equal size small balls from the dough, make a slight dent in the centre of the ball with your thumb. Add Clarified Butter in a frying pan and heat over low flame. When Ghee is hot, gently slide in the prepared dough balls and deep-fry on low heat. Gradually the Balushahi will start floating to the top. Fry till it turns golden on both sides. Remove them from Ghee when they turn golden and keep on a plate. After 1 minute, soak deep-fried Balushahi in Sugar Syrup for about 1 minute and then remove from Syrup and place on a serving plate.